Top Hamas engineer tells all. Hamas has an Engineer ? 1. On Zionist casing, take Tab A out of Slot B. 2. Open fuse housing case. 3. Carefully cut the wires leading to the fuse. 4. But first, remove the fuse. Hamas engineer Dirar Abu Sisi, nabbed by Israeli security forces earlier this year, provided interrogators with priceless information on Hamas’ modus operandi, the terror group’s readiness for a clash with Israel and attempts to improve its rocket range. Hamas men were undertaking their studies at mosques, while passing their final exams in known Gaza universities or in mosques. “The books and academic materials did not bear the Hamas name or logo,” he said. Instructors include university lecturers, education ministry officials, merchants and others. 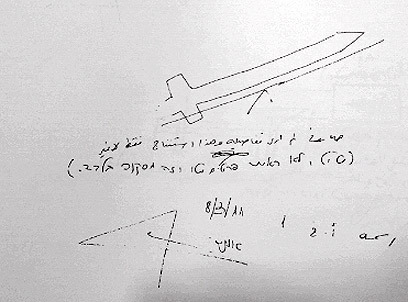 Abu Sisi’s interrogation revealed that he acquired plenty of information on improving rocket range via the Internet, including the YouTube website. “I know nothing about explosives. I only calculated the pressure and heat…I downloaded the formula from the Internet,” he said, adding that he also downloaded software pertaining to the rocket’s structure. Hamas would send its activists for further instruction overseas, Abu Sisi said. Selected graduates of the academy reached military academies in foreign countries, he said, including Syria, Yemen, Sudan and Iran. Oh good…… The internet and YouTube. I bet the single and lasting result of this little tidbit will be the requirement for pre-web use registration of all bitterly clinging Hobbits, including ‘permanently installed personal GPS locators’. Wait …… Hamas has an ‘Engineer’ ? He used Qur’an Sira and Hadith, a normal Islam son. Abu says…’Love to kill Teh Juice’! Abu says…’Really rings my bell’! Abu says…’Love to Kill Teh Juice’ ! Hey you typical Muslim: Go to Hell ! This entry was posted on Friday, August 12th, 2011 at 04:34 and is filed under Main Postings. You can follow any responses to this entry through the RSS 2.0 feed. You can leave a response, or trackback from your own site. 2 Responses to Top Hamas engineer tells all. Didn’t know you were a poet. Watching all these characters gives me a headache, but not watching them makes me nervous. Hope we live to see the end of this nightmare. You never saw the old ‘Good-‘N-Plenty adverts ?